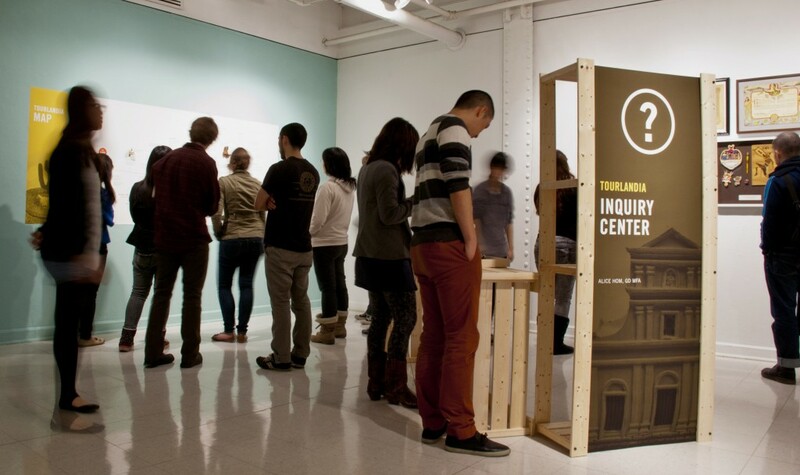 MFA thesis by Alice Hom // Where do you wonder? 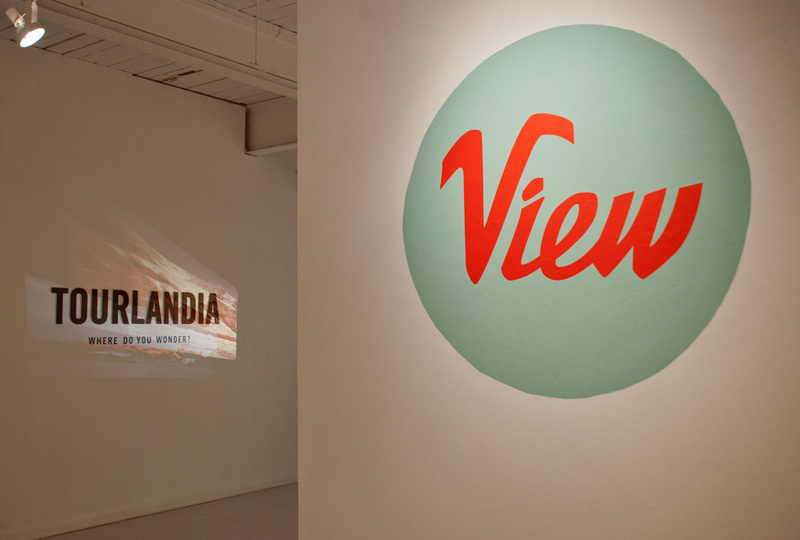 The Tourlandia Meta-tourism Bureau studies the astounding landscape of the tourism world. Guided by the desire to capture views seen only in the touristic state, the Bureau follows a windy path through the terrain of scripted journeys and staged environments and collects artifacts of the tour experience for further investigation. 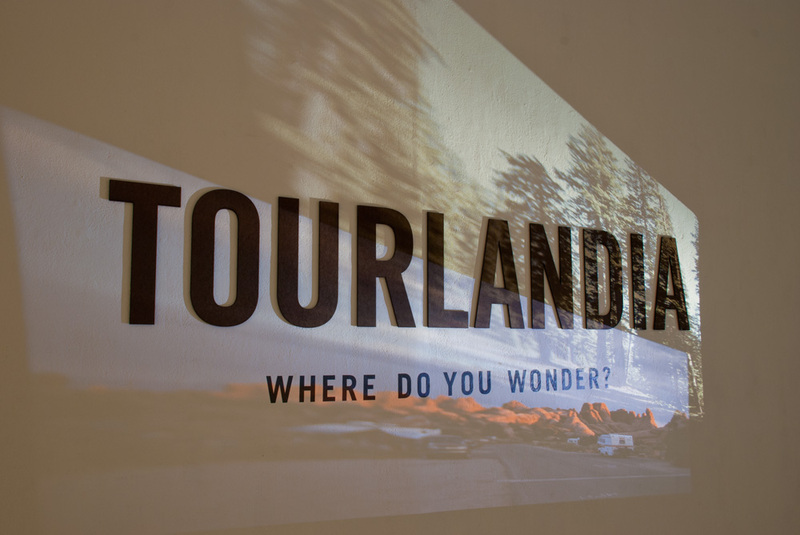 Tourlandia Inquiry Center inverts the usual purpose of a visitor center as information distribution and welcome center to a place for questioning personal expectations and motivations behind universal touristic behaviors. 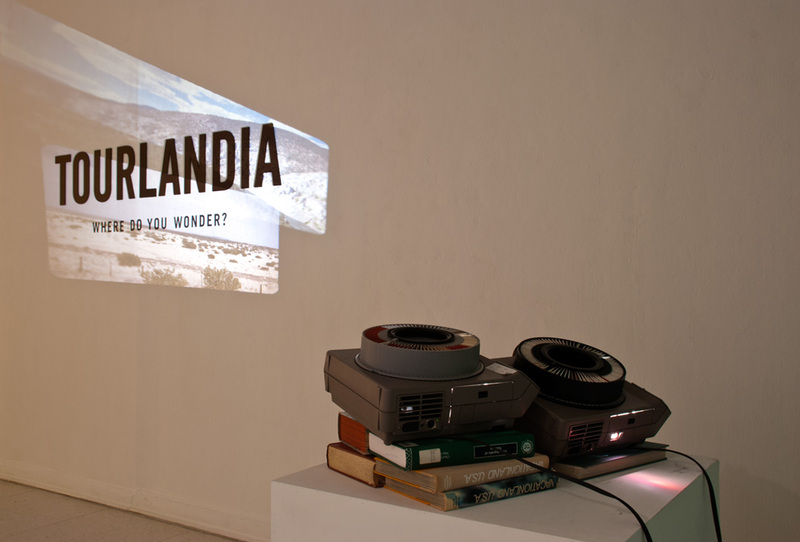 The installation uses analog display techniques to represent the reconstruction of memory as filtered through nostalgic media. 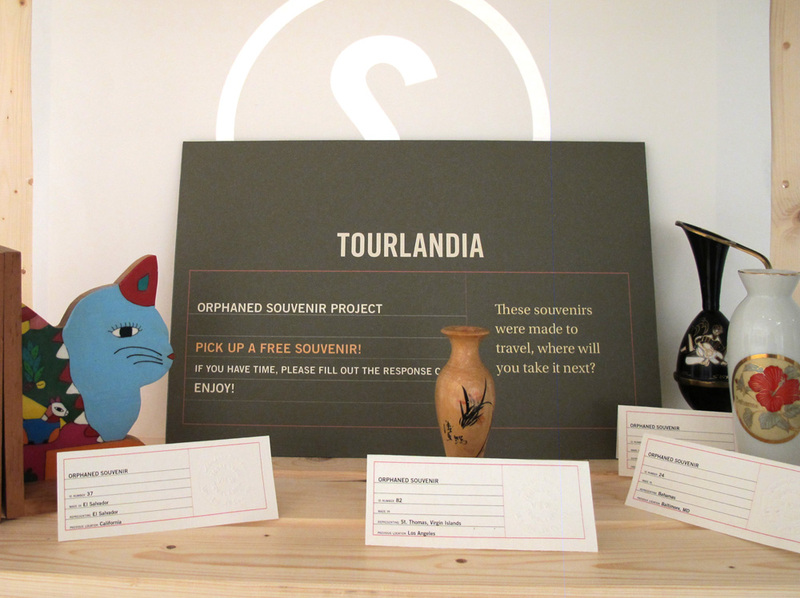 During the show opening, a souvenir stand was operating where visitors can adopt an orphaned souvenir in exchange for filling out a response card. The replies were analyzed to discover if selection is based on desire, novelty, familiarity, or personal memory. For the rest of the week, the souvenir stand featured a station for filling out and embossing a souvenir certificate. 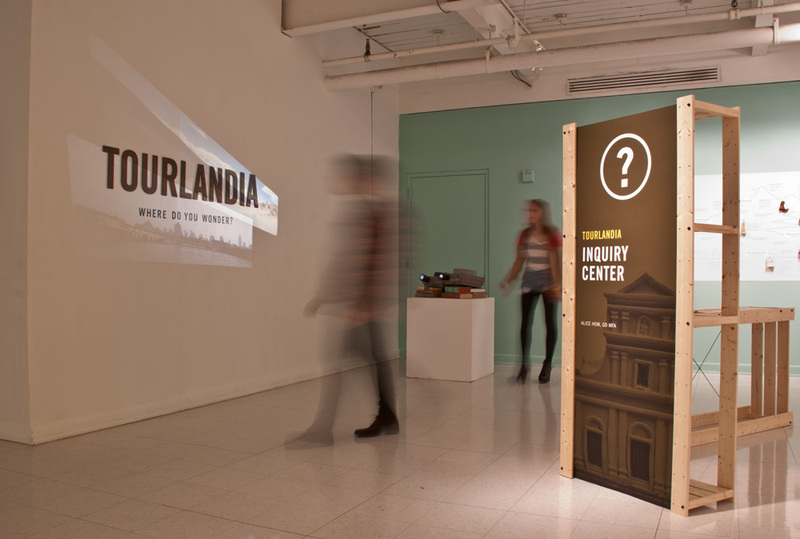 Welcome to the Tourlandia Inquiry Center, this is a space to reflect on tourism's representation of cultural interactions and each person's internal quest for meaning through the metaphorical and literal journeying. Our purpose is to create a safe place for you to find questions to your answers. The view that you’re looking is a slideshow collage of tourist landscape photography. 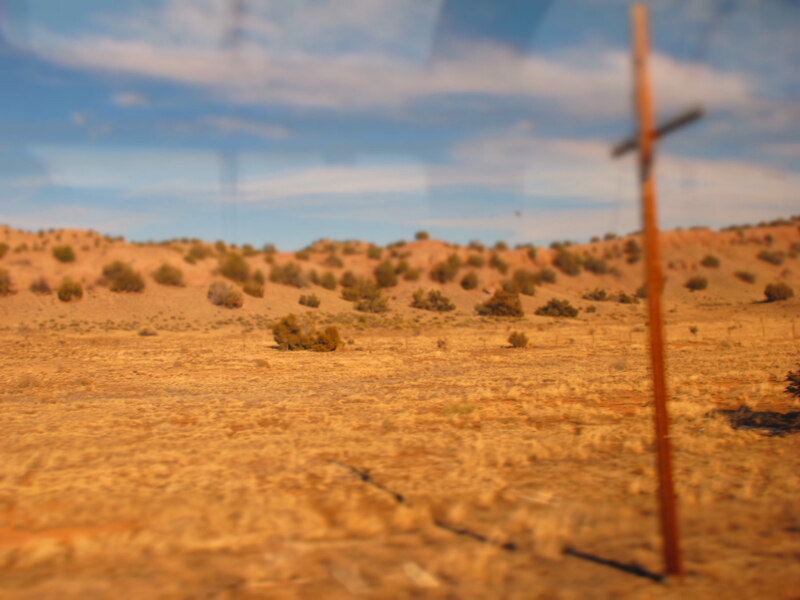 The distortion and superimposition represents the distortions of memory, while the format invokes nostalgia. 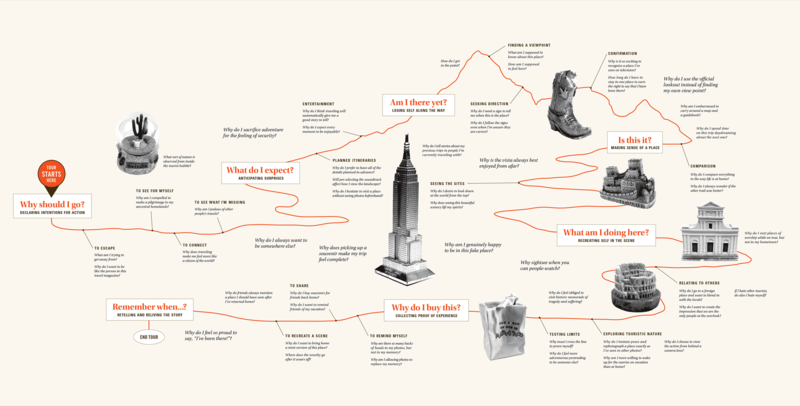 Next is the wall map for your journey through tourist consciousness. 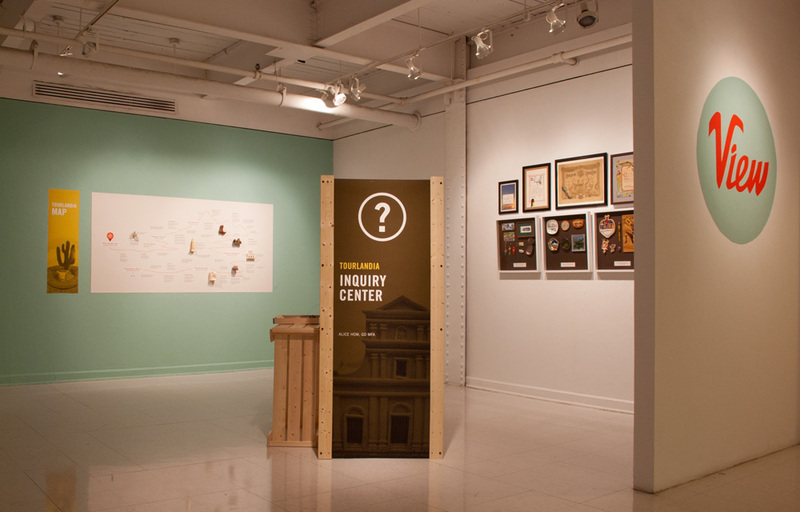 Attractions include questions of self identity, motivation, and purpose. It is a reflective map, the landscape contour is shaped by the pathway one takes. 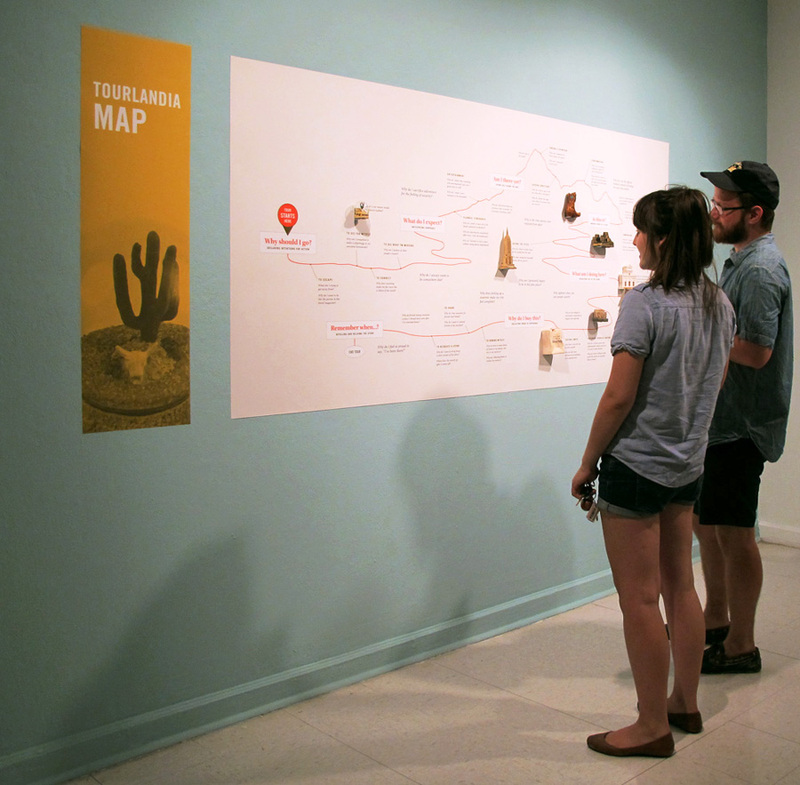 Souvenir artifacts represent site typologies rather than the specific site. 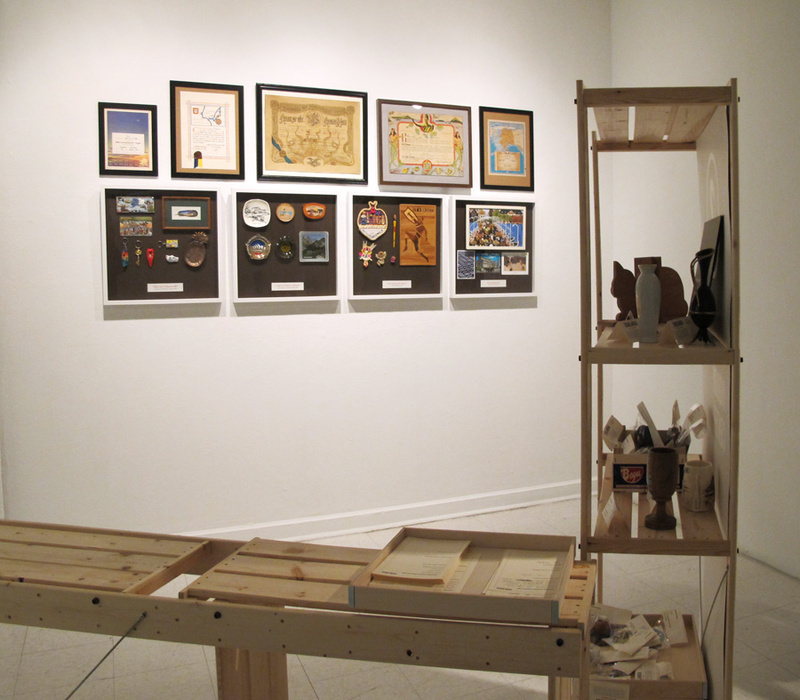 The souvenirs on display in the cases here represent common typologies seen in objects sold to tourists. The top row are certificates of passage on different modes of transport, including Neptune Rex naval certificates given to sailors in line-crossing ceremonies for celebrating equator crossings. 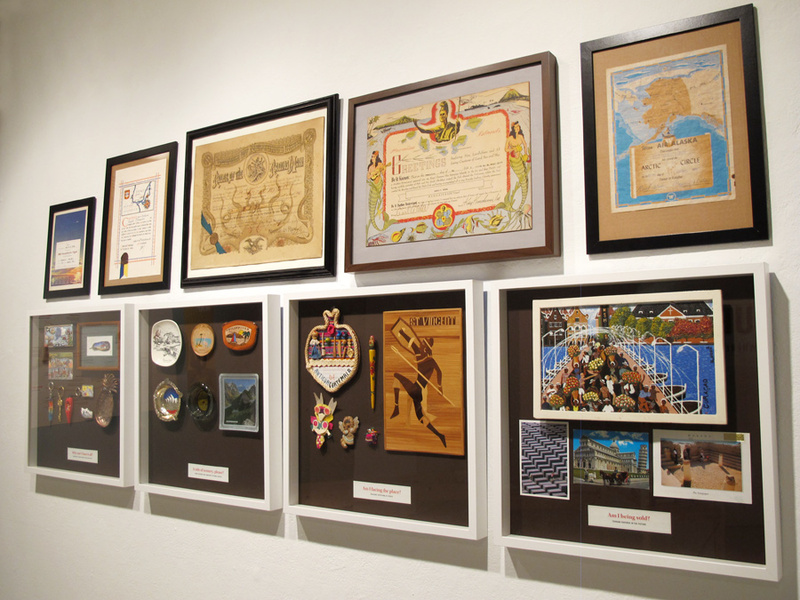 These certificates recognize accomplishments in the touristic mode. Selection of a souvenir is a very personal act of choice by the tourist. And the gifting of souvenirs to friends is a common but strange ritual. All of these objects were collected through secondhand channels: donations and thrift store finds. They carry a history of purchase, display, and being discarded to a secondary market. Novelty items have a lifespan, and are reused once more in this display. Souvenirs were redistributed in a souvenir stand during the opening reception. Visitors were invited to adopt a souvenir in exchange for filling out a questionnaire asking: Why did you select this object? Have you been to the place represented? What does this object remind you of? Where will you take this object next? And so this concludes our tour. Some visitors like to take home a souvenir certificate of passage. Please stay as long as you like to find your way to a new view. 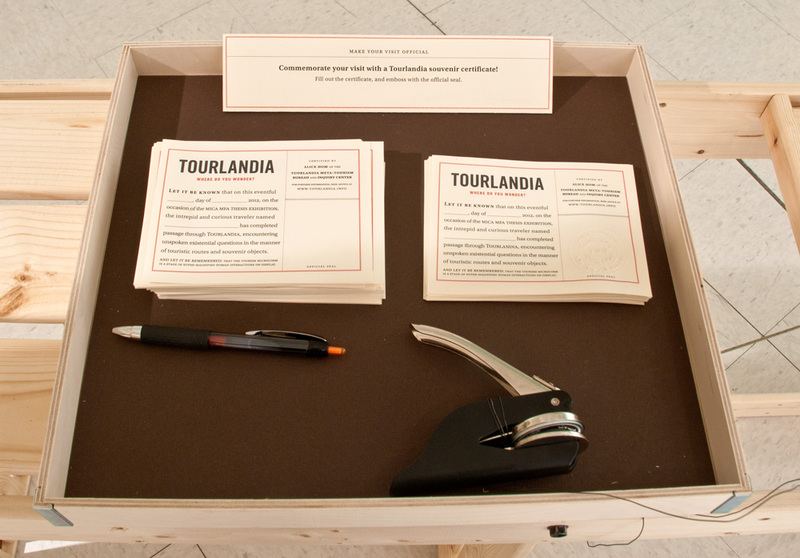 Tourlandia is a MFA thesis by Alice Hom // © 2012, all rights reserved. // Archived: 5/7/2012. Live version: www.tourlandia.info.